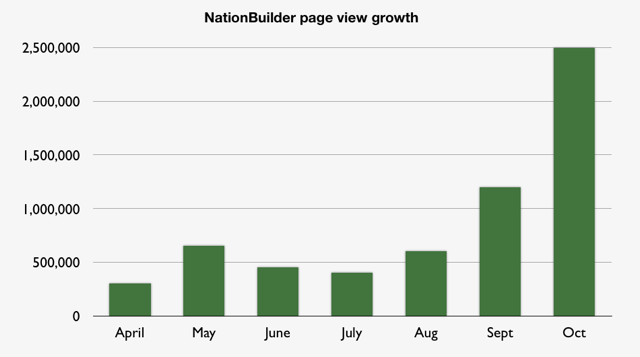 If you’re running a political campaign, a charity, or any other group where keeping in touch with community members — and/or delegating tasks to them — is critical, then you’ll probably be interested in a startup called NationBuilder. The service launched in April, closing a $500,000 seed funding round the following month that was led by Chris Hughes. Hughes is best known for cofounding Facebook and leading President Obama’s online campaign efforts in 2008 (in other words, he’s exactly the sort of backer you’d want for this kind of startup). And this fall, it’s started getting some strong traction. In September it had almost 200k unique visitors doing 1.2 million page views — that jumped to 400k uniques the following month, with 2.5 million page views. The service now has 300 groups on board, with a total of some 1 million supporters signed up. One of the site’s core features is fundraising, and groups have raised $3.3 million so far using the platform. 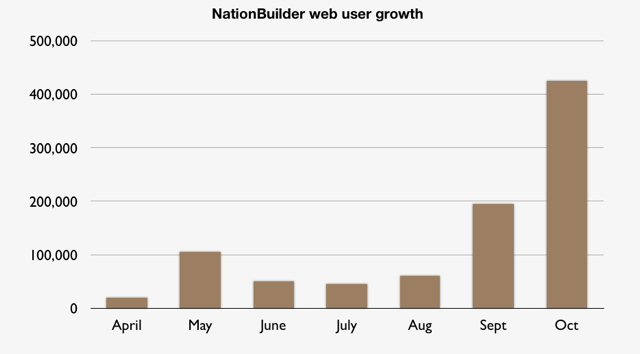 Now that it’s got its feet under it, NationBuilder is ready to ramp things up. Thus far the service has been limited to groups with fewer than 200,000 members, but now it’s opening up to larger groups, which will obviously pave the way for even more growth. And while many of the site’s current groups revolve around a political campaign or non-profit, other groups are using it too, like the Beall Elementary PTA and a community around the documentary Stem Cell Revolutions. Gilliam says that ultimately the site’s target market is much broader than politics and non-profits — it’s “everyone building a community online”. You may also be interested in checking out social fundraising platform Rally.org (you can find our previous coverage on it right here).